They're cute and they help to keep the insect count down around your home, but little geckos can also be the cause of big problems if they get into places they shouldn't be, like your home's electrical systems. The tiny reptiles love to find warm, dark, humid places to hide, sleep away the day and breed. There are dozens of these spots around your home, from the ceiling space to the gap behind the oven, where the worst they get up to is make a bit of a mess. However, in other spaces, their stay is not so trouble free. A gecko living in the switchboard or inside your air conditioner can cause a range of problems from electrical faults, appliance failure, and, like the recent gecko related incident in Taringa, fire. The house fire in Taringa last week was thought to have been caused by a gecko in a split system air conditioner located in one of the bedrooms. The fire, which took more than 30 firefighters to extinguish, destroyed the family's home. It's astounding to think that something so small could cause such devastation. Prevention is the best plan when dealing with problems caused by geckos as well as other insects and small vermin. Your first task should be a visual check of the safely and easily accessible electrical components around your home, such as the main electrical switchboard. Can you see evidence of geckos or any other pest? Often the most noticeable sign of geckos is their poop, they are little poop machines, it will be everywhere. If you have an old style switchboard which is mounted on a wall outside your home in a big metal or wooden box plugging obvious spaces in the door or box surrounds will help to keep the critters out. Next step - Call in a licenced electrician to carry out a thorough review of the potentially at-risk electrical components and appliances, such as the air conditioner throughout your home. There are several products on the market that prevent gecko related shorting or damage which your electrician can install at your request. Please note - attempting to check these systems yourself could pose an electric shock risk and may void your product warranty. 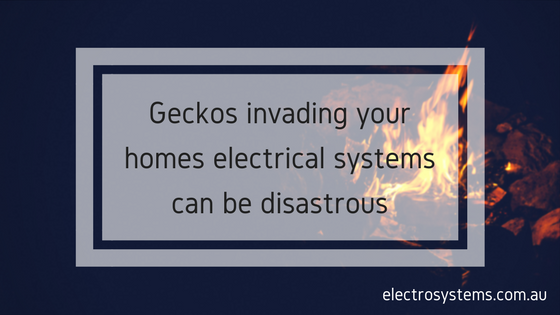 Don't let geckos cost you in appliance repairs or property loss, get your electrical systems checked today.